The GoECOlife 10 Sheet Paper Shredder seems like a fairly unknown product. It only has 8 reviews on Amazon, and all but 2 of them are 5 stars. Because of those two reviews, it is sitting at 3.7 stars. So is this a diamond in the rough, or a complete dud? Let's find out. 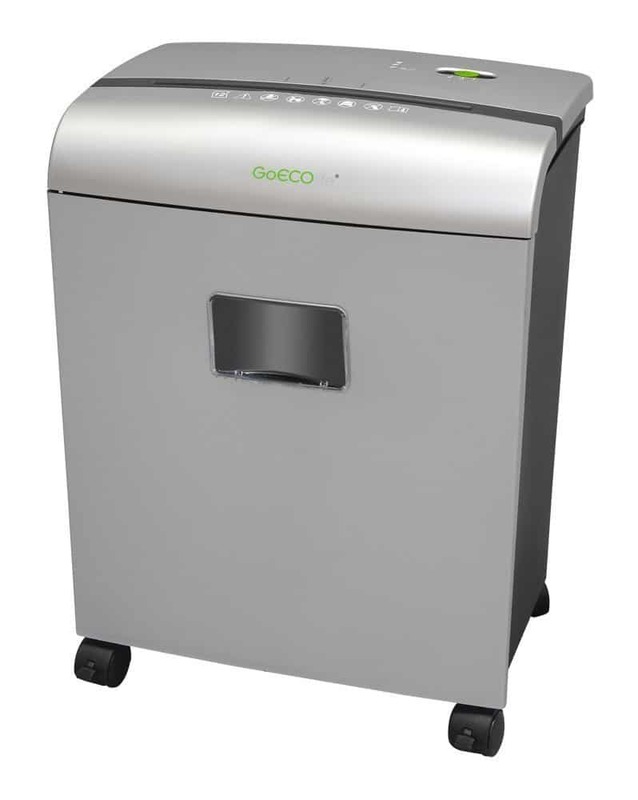 The GoECOlife 10 Sheet Paper Shredder, besides having a ridiculously long name, is also a micro cut shredder. By far the most secure choice out of the three types. These bad boys will reduce your documents to confetti-like pieces of paper. It can turn one sheet of paper into more than 1,500 pieces Good luck trying to put that back together. These are typically used by research facilities and government agencies, to provide the best security possible in disposing of top secret documents. For personal use, if you are seriously paranoid or an undercover spy, this is the one for you. Otherwise, it is definitely overkill. It also features a very compact design. It sizes in at 12.9 x 9.1 x 16.9. It also has wheels on the bottom that allows for quick and easy storing when it is not in use. Of course, it can also handle 10 sheets at a time with a bin size of 4 gallons. While this is smaller than others, the size of the shredded paper is extremely small that it will not take up a whole lot of space in the bin. The features of the GoECOlife 10 Sheet Paper Shredder are where this product really shines. Of course it has the basic on/off switch. However this one is even more simple. It only has the on/off mode along with a reverse mode. There is no option for continuous run. While this may seem as an inconvenience for some, it actually makes sense when looking at the company. GoECOlife is all about saving energy, so including a continuous running mode would be a bit counter intuitive. Speaking of energy saving, one of the best features of the GoECOlife 10 Sheet Paper Shredder is its Energy Saving Technology. This essentially eliminates vampire energy loss by preventing power drain when the shredder is not in use. On top of that, this product is also carbon neutral. Basically what this means is that the manufacture and distribution (including end of life and recycling) of this shredder has been carbon offset. So for those who are very eco-conscience, this is a great product to have. When taking a look at the collection bin, it has a very convenient pull out design. You do not have to remove the top to empty the bin, like you do with other models. Simply, pull out the bin, remove the plastic bag and insert another, and you are good to go. In addition, this shredder is also fitted with wheels on the bottom that allow for easy stowing when not in use. Another feature of this shredder is the speed at which is does the job. It can shred 7 feet of paper per minute. That is pretty crazy. Pair that with a 5 minute continuous run time and do some quick math, that is 35 feet of paper in 5 minutes. Now of course, if you are continuously shredding for 5 minutes, not only will you possibly go a bit crazy, but you will also have to wait near 50 minutes for the shredder to cool down. You can simply shred in intervals throughout the day and easily avoid that long cool down, so it should not be an issue. Also, while we are on the topic of continuous run time, it is also worth mentioning the noise this thing makes, because a loud shredder can ruin the atmosphere of an office. Luckily, this product is ultra-quiet. I can not say for sure what kind of noise it makes, but taking ultra quiet at face value, probably just a hum. Pretty nice for a busy office. GoECOlife is, as the name says, a very eco-minded company. They are based on the principles of performance, best in class, responsible, innovation, and stylish. Each and every product they have available are energy saving, and carbon neutral. In fact, their products and manufacturing practices meet the Carbonfund.org's Carbonfree Product Certification protocol, which requires 3rd party life cycle assessment of the product's carbon footprint, and carbon reductions in support of 3rd party validated renewable energy and reforestation projects. Unfortunately, there is not a whole lot of information about the company or who, where and when it was founded. But it seems like they have been around for a while and have a fairly expansive product line. They have a bunch of different shredders and accessories including industrial size shredders for large offices running a maximum of $2200.00. So whatever your shredding needs, odds are you can find it here. The GoECOlfie 10 Sheet Paper Shredder is a micro-cut style shredder. This is perfect for completely destroying highly classified documents as it reduces one sheet into nearly 1,500 confetti like pieces. This shredder has a very compact design. Pair that with the wheels featured on the bottom, make for very convenient stowing when the device is not in use. The best feature of the GoECOlife 10 Sheet Paper Shredder, which is actually standard in all of their products is the energy saver technology. This prevents any power drain when the shredder is not in use. It is also compliant with protocol set by the Carbonfund.org. Seven feet per minute, plus a 5 minute continuous run time. That gives you 35 feet of paper in 5 minutes. That's a lot of paper. Plus, this product does the job as quiet as a church mouse....probably. There is no anti-jam technology here, or sensors. While those are not standard, it would be nice to see. So just be care when using. There is also no multimedia shredding capabilities. The most you can shred are credit cards. This is a bit disappointing, but there are other ways of getting rid of CDs and DVDs. While the paper capacity is not anything super special, it is good enough. Looking at all of the other great features this product has, it seems like this will be a good buy. Especially for those who are very eco conscience and looking to reduce their footprint, while still trying to get work done. However, the lack of multimedia shredding is rather surprising. This is something that is almost standard in most high-end shredders. Then again, I could not tell you the last time I actually used the multimedia shredding option, so maybe the lack of that feature is not so bad. So, if you are secretly an undercover government agent and need to discreetly dispose of top secret documents without your fake family finding out, this is definitely the product for you. Or if you work in an office with classified documents, that works too. Either way, you can grab one on Amazon, on sale, for $149.99. The original price is $199.99, so you're saving $50. For any and all other information, including the best paper shredders, check out the rest of Green and Growing. Here are some top questions that I found for people seriously considering buying the GoECOlife 10-Sheet Paper Shredder. Does this shredder require a bag insert? Yes, there needs to be a bag to catch the remains of your shredding. How long can it continuously run for before needing to cool down? 5 mintues, with a 50 minute cool down.